Karen Spencer has worked in education for her entire career. After graduating from Valparaiso University in Indiana, she went on to receive her master in education degree from the University of Virginia. Her love of education began when she was a tour guide at Valpo and in the admissions office of the Curry School of Education at UVA. She began her professional work in residence life at Hope College (MI) and then at Franklin & Marshall College (PA) in admissions. 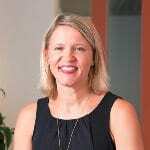 Most recently Karen worked as the assistant director of undergraduate admissions at Georgetown University (DC) where she was responsible for recruitment and transfer admissions, and sat on the admissions committee for the McDonough School of Business.